Spinal cord and peripheral nerve injuries account for the majority of neurologic conditions that can benefit from rehabilitation. 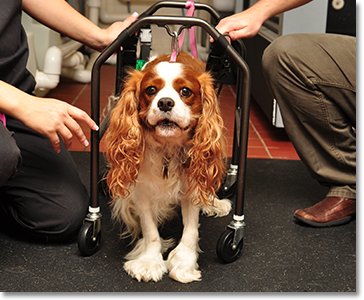 For our neurologically injured pets, our goals are dedicated to improving their function and quality of life. Spinal cord injuries are a common problem in dogs, most commonly caused by disc herniations, trauma, spinal stenosis or instability, and vascular (stroke like) events. Spinal cord tissue does not regenerate effectively and the consequences of spinal cord damage can be devastating. Dogs can make an excellent recovery after injury if the damage to the spinal cord is partial because the surviving nerves are able to take over the function of the nerves that have been lost. Rehabilitation can have amazing results and can give the dog a new lease on life.